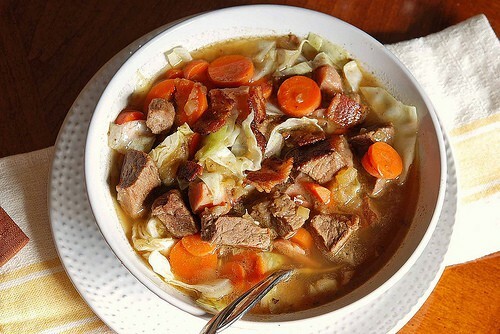 Hearty Beef and Ham Stew is a broth-based soup with beef stew meat, ham, bacon, carrots, cabbage and apples. This stew will fill you up and satisfy without making you feel heavy. It is one of my favorite recipes on this blog! Besides meeting up with wonderful people, you sure can meet up with some delicious recipes at church. It’s also a good place to meet a husband. I should know. But that’s another topic. I wonder if any of my church friends/readers remember when Jane and Jane served this for a ladies luncheon several years ago. Even though I can’t remember their last names, I will never forget this stew. Sharing recipes can have long lasting benefits. Really. People will think of you every time they make your recipe. Maybe they’ll give you a call, or send you a Christmas card. Or at the very least, tell the world how generous you were to share a good recipe with them. 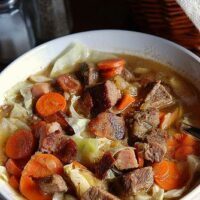 Hearty Beef and Ham Stew is an unforgettable combination of salty, smoky bacon with a mysteriously delicious broth full of meat and vegetables. Finely chopped apples are the secret ingredient. You can’t see them without close inspection, but they work magic in this cold weather favorite. I would be content with a piece of hot, crusty cornbread and a bowl of the broth alone. Fry bacon in large dutch oven and set aside. Chop onions and apples. Saute beef and chopped onion in bacon grease. Add apples, broth, 2 cups water and bay leaf. Cover and simmer for 1 1/2 hours. Depending on how much the broth has reduced, add another 2 cups of water. You need enough to cover ingredients with a little to spare. Add carrots and ham 30 minutes before serving. Ten minutes before serving, add cabbage and bacon. Cabbage should still have a slight crispness to it. Remove bay leaf before serving. If you prefer, add browned beef, onion, apples and broth to a crock pot and cook on low for 6-9 hours. Transfer back to pot on stove to finish cooking carrots, ham, cabbage and bacon. I made this for dinner guests. It sounded so appetizing and my friends went back for seconds. Thank you Paula. I am so glad to know about your web site. I’m goin’ shoppin for more great food to cook! Paula, we made this tonight and it was wonderful!!! We loved all the flavors and it is very filling. This is one we will make over and over again!